Pull request Compare This branch is 9 commits ahead, 1559 commits behind eclipse:master. WIP: Eclipse SmartHome Bluetooth Binding. This binding is still work in progress. The main goal is to merge vkolotov's OH BluetoothSmart binding and cdjackson's BLE binding. Flexibility in using different transports, e.g. serial port, DBus or any other (like tinyb). Extensibility in adding new supported devices (new OH addons), e.g. different sensors and other hardware. Robustness. Due to the nature of the Bluetooth protocol, we will have to make our bindings stable enough so that people could use it. This is the biggest challenge for this project. 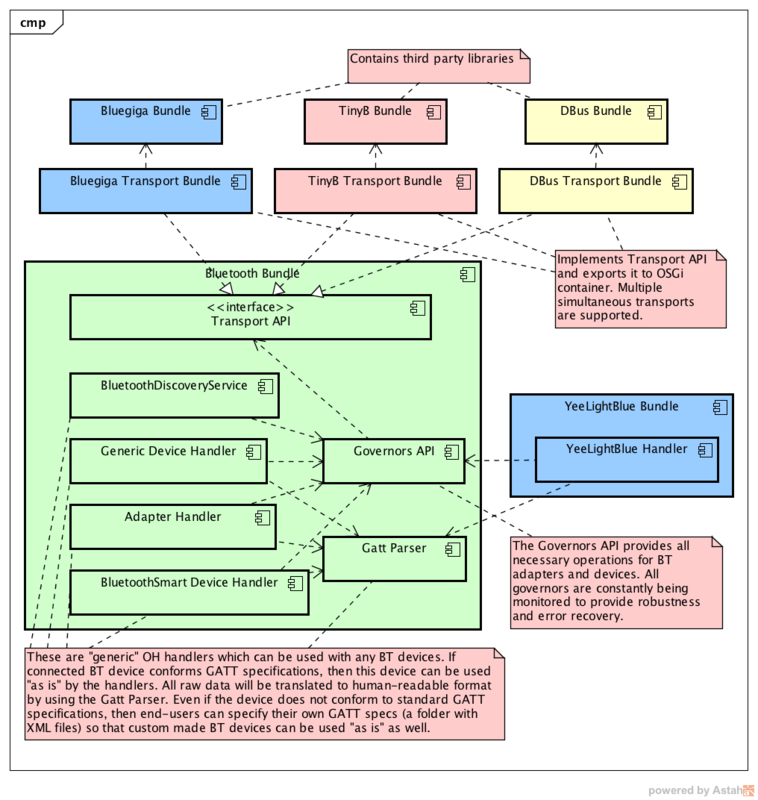 Implementing/merging BlueGiga transport/bundle - 70% DONE. This is a useful component which allows us to identify any BT resource. It is similar to @cdjackson BluetoothAddress, but it also supports locating BT adapters, services, characteristics and GATT fields. Even if multiple adapters are used, the URL can precisely identify resource of a BT device. That class is reasonably documented, so take a look at the comments in the file for more info. The Bluetooth URL can help to address Flexibility and Extensibility KPIs. This is an API which is supposed to provide an abstraction layer between hardware and OpenHab. The API provides common interfaces for BT adapter, device, GATT service, GATT characteristic. It also supports plugging in different implementations for different transport types, such us serial port transport or BDus transport. In order to do so, a new transport layer must implement a limited number (actually only 4 interfaces, an example here) of interfaces. 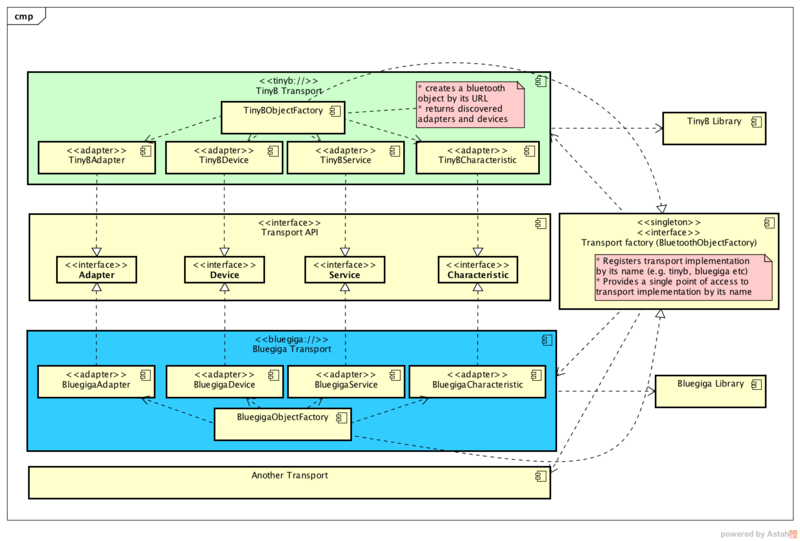 This abstraction layer can help to address Flexibility and partially Robustness. As a first step, I would leave TinyB transport as a main transport for linux based set-ups, however I agree that this should be converted to be using native DBus adapter. I can even suggest a good candidate for this work - hypfvieh. I had a chat with David a couple of months ago, he might be interested in this. It is a set of APIs and processes which are responsible for robustness of the system. 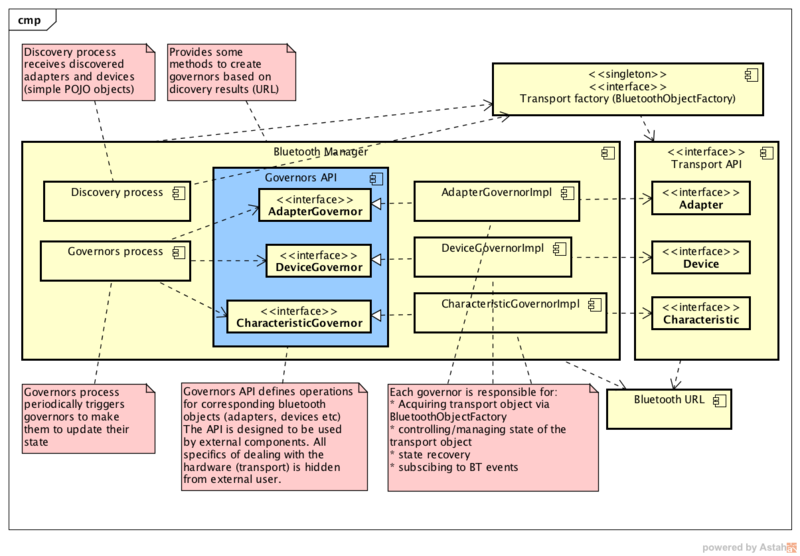 The central part of it is "Governors" (examples and more info BluetoothGovernor, AdapterGovernor, DeviceGovernor and BluetoothManager). These are components which define lifecycle of BT objects and contain logic for error recovery. They are similar to the transport APIs, but yet different because they are active components, i.e. they implement some logic for each of BT objects (adapter, device, characteristic) that make the system more robust and enable the system to recover from unexpected situations such as disconnections and power outages. Apart from making the system more stable, the Governors are designed in a such way that they can be used externally, in other words it is another abstraction layer which hides some specifics/difficulties of the BT protocol behind user-friendly APIs. Obviously the Bluetooth Manager is supposed to help us with Robustness and Extensibility KPIs. It is a component which can translate BT raw data into user-friendly format. In short, it reads GATT specifications (xml files) and converts raw data into map of: Field name -> value. Works both ways, e.g. raw data -> fields (read operation) and fields -> raw data (write operation). All complex logic related to bit operations, type conversions, validations etc are hidden in this component. More info here. This component will allow us to create "generic" OH handlers which can work with any devices that conform GATT specifications OR users can supply their own implementations for GATT specs in XML files to add their own custom made devices. As you can see that diagram reflects the diagram pointed out earlier. It is quite similar. There are bundles to add transport, bluetooth binding APIs and some specific binding for a particular device (YeeLightBlue). The only significant difference is the way how transport is plugged in to OH. In contrast to @cdjackson implementation, the transport implementations are plugged in to Bluetooth Manager via well defined transport APIs. Another difference is that all OH handlers are supposed to work with the "Governors API" which provides/separates handler specific logic from dealing with BT protocol nasties. Please note that on the diagram green colour means that it is already implemented (well to certain extend that it can be thought that it is implemented), blue and red colours - something we need to develop/merge. In my mind, the blue components can be implemented/merged by @cdjackson and the red components by me. Of course we all need to put some effort in polishing the green components, however I promise to take the main responsibility in supporting the green stuff.